In the whiskey-foxtrot-tango category of bad things I've done as a knitter, comes this unforgiveable mistake when knitting with hand-dyed yarn: not alternating skeins as you knit. I know better. After all, I dye yarn myself and understand that even with great care, handpainted skeins aren't going to be a perfect match. And Malabrigo Yarn, which I love as much as life itself for its beautiful colors, is notorious for throwing skeins that don't match, even in the same dyelot. Which is to say, anyone with an ounce of sense who is knitting with Malabrigo knows to swap skeins every few rows. But, in my excitement at starting this project, I … forgot. 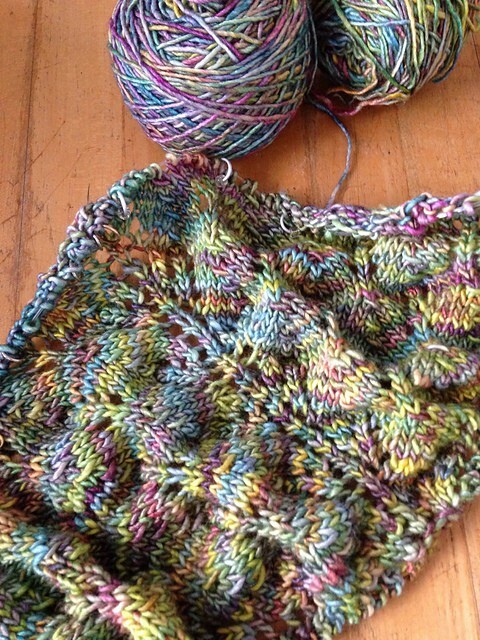 This is Evelyn Clark's Shetland Triangle Lace Shawl, and I have been wanting to knit it for a long time. It's a simple lace pattern, knit in DK weight yarn and I chose the indescribably delicious Arco Iris colorway in Malabrigo's Silky Merino yarn. I had four skeins. You can see right off in the picture that although it isn't horrible, the second skein down from the top has a lot more bright yellow in it than the rest of its cadre. So, you guessed it, that's the one I started knitting with. They don't even look like the same colorway. The one on the right, the skein I started out with, is not even in the same universe as the one of the left, which I am currently knitting from. Quel disaster! Here I am, about four rows into the new skein (this photo has the truest colors of any of them — I do love Arco Iris). One could almost convince oneself that it was all going to be okay. That despite carelessness, just this one time, the knitting gods were smiling, and it would all work out. However, I have learned that such hopes typically get smashed a couple of inches in. I haven't made a mistake like this in years, actually, in seven years, since this sweater, which I knit in 2007, showed a clear line between skeins. You can't see it well in this cleverly staged photo, but particularly in the back, there was a line of demarcation that was as clear as the Berlin Wall. Already, my thoughts are turning to clever strategies like a gentle, unifying overdye to tone the different skeins into submission. I could, and probably should, frog this back to the first repeat and go forward in a more knitterly fashion. But I'm going to hold my breath and see what happens.